Last night I witnessed one of the best-pitched games in the minor leagues that I’ve seen in a long time (perhaps ever). 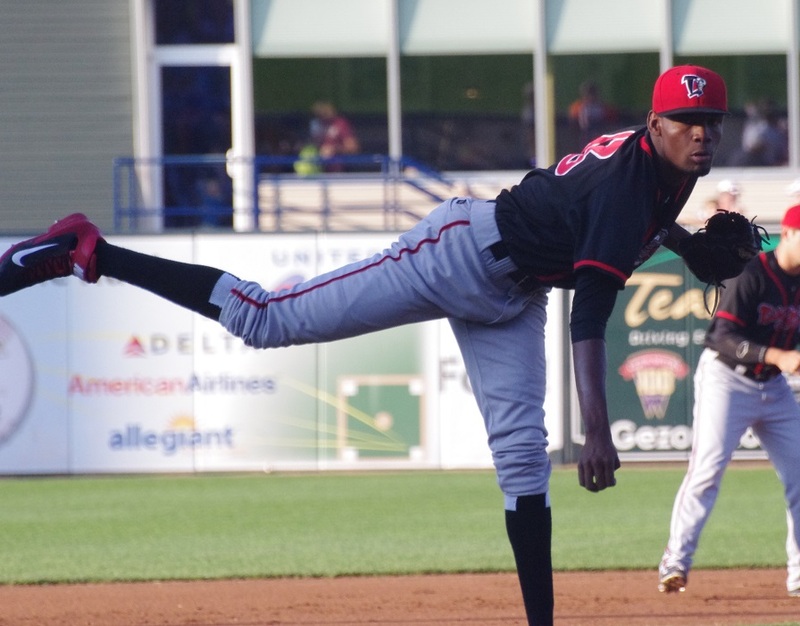 On the road in West Michigan (just outside of Grand Rapids), the Lansing Lugnuts put 19-year-old Dominican righty Miguel Castro on the mound against Austin Kubitza of the West Michigan Whitecaps. 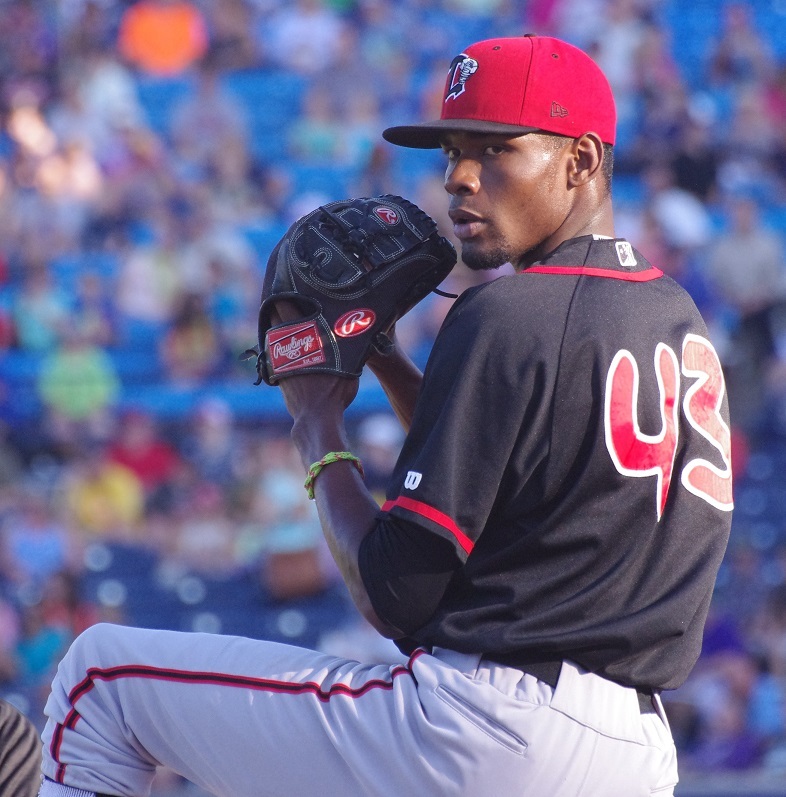 While I was very impressed with the hard-throwing Castro, Kubitza was tremendous and showed why he’s been one of the best pitchers in the Midwest League this season. 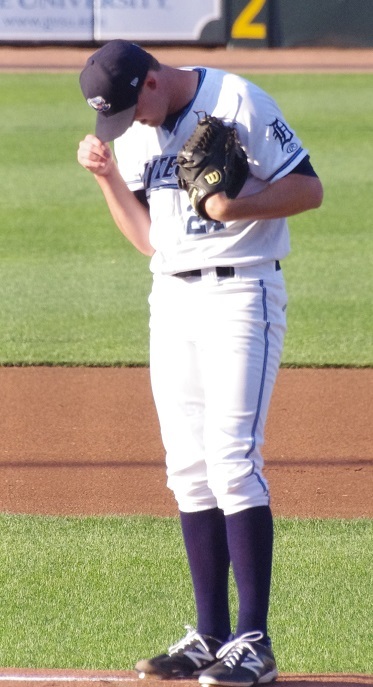 Drafted in the fourth round of the 2013 draft by the Detroit Tigers, Kubitza has spent the entire season in West Michigan and it was plain to see last night why he’s got such gaudy stats (2.38 ERA, 1.08 WHIP, 136 Ks in 125 innings). Standing 6-foot-5, Kubitza uses all of his size to advantage, pitching from an over-the-top arm angle and getting incredible sink on his fastball. While not overpowering, his sinker is devastating and is extremely difficult to get in the air, as can be attested by a 4.02 Ground-Out-to-Air-Out (GO/AO) ratio this season. Last night, that ratio was 14 ground-outs to just three fly-outs on the night over 7 2/3 innings, striking out six. While he throws in the high-80s, everything he has moves and most of the contact that he induced last night was very weak. On the other side of the coin, 6-foot-5 Miguel Castro throws from a low, three-quarters arm angle. He has extremely long arms to go with his lanky frame and the ball just explodes out of his hand, reaching speeds of 97 mph from a very low-effort delivery (all radar readings are from Lugnuts pitchers who were charting the game). There’s sink to his 2-seam fastball too and Castro seems to get more movement when he backs off a bit, throwing 93-94 mph. Castro complemented his heater with a slider that sat in the 80-83 mph range and a changeup that ranged from 84 mph to as fast as 88 or 89 mph unless I was misidentifying the pitch (I plan to ask pitching coach Vince Horsman about that). EDIT: I did ask Horsman and he confirmed that Castro’s changeup does get up into the high 80s and he’s working on having some more velocity separation between the fastball and changeup. Castro mowed down the Whitecaps hitters yesterday, retiring 17 in a row after giving up a single to the first batter of the game. Castro was definitely pitching to contact, keeping his pitch count down (he only needed 74 pitches to get through seven innings) and the Whitecaps were having a tough time with him. The “hit” he allowed in the bottom of the sixth was a bunt single that he bobbled himself while fielding with his bare hand. In the seventh, he ran into some trouble, giving up a double on a 95 mph fastball and then walking the next batter. After a visit from Horsman, Castro got the next hitter to fly out to Ian Parmley in left who then threw out the runner from second trying to tag up and take third. The next batter grounded out to second base to end the inning, the threat and Castro’s night. For me, the changeup has the potential to be a true plus pitch for Castro. It has great sink to it and generated the most swings and misses of any of his pitches. Combined with the fastball, it presents a very tough combination. The slider has potential to be a solid pitch. It’s kind of slurvy at the moment and (thanks to his low three-quarters arm angle) it can get “frisbee”-like at times (it moves more in the 9-to-3 clock-face direction) but it has plenty of movement. The biggest weakness that Castro has right now is his command. His pitches have enough life on them that he can get away with throwing the fastball in the strike zone and pitching to contact. He threw about 62% of his 74 pitches for strikes but he didn’t spot pitches in specific locations enough for me to think that his control within the strike zone was deliberate. The other thing that I noticed was that Castro wasn’t finishing his pitches late in the game and he missed to his arm side on three of the balls to the batter that he walked in the seventh inning (in the 65-70 pitch mark). One further drawback was probably the fact that Castro appears to be very easy to run on. The Whitecaps stole two bases off of him. That said, a 19-year-old who throws 95 consistently and has a changeup that is already very good against Midwest League hitters is a terrific prospect to have on your team and Castro’s “weaknesses” are things that almost every young pitcher goes through. His stuff is very advanced and as long as he can throw strikes with the Lugnuts, Castro will likely be very good in the Midwest League. While the Lugnuts lost after reliever Matt Dermody allowed two runs to score in the bottom of the eighth, it gave a (near?) sold-out crowd at beautiful Fifth Third Ballpark a big thrill. I was actually pretty amazed at how loud the crowd got when I was sitting in the stands. They didn’t have much to cheer about while Castro was on the mound but the roars were pretty deafening when Raph Rhymes hit that leadoff double in the seventh. It was an exciting game pitched by two great pitchers in a lovely ballpark with a lively crowd.